Messaging service Telegram has promised to shut down terrorist-related channels after Indonesia's government partially blocked access to its platform. The Ministry of Communication and IT blocked Telegram's web version on Friday and threatened to stop access to its app as well. Jakarta claimed Telegram had been used to promote radicalism and to give instructions for carrying out attacks. The firm's founder said he was "upset" by the move. In a note posted to his Telegram followers, Pavel Durov said his firm had now removed all terrorist-related public channels reported by the government. It is now forming a team of moderators with knowledge of Indonesian language and culture to remove terrorist-related channels more quickly, he said. 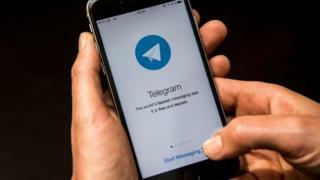 "Telegram is heavily encrypted and privacy-oriented, but we're no friends of terrorists - in fact, every month we block thousands of ISIS-related public channels," Mr Duroy added. The government's move comes amid increasing concern over the Islamic State's rise in Southeast Asia. The group has claimed involvement in a string of attacks in Indonesia this year, and has fought running battles against the army at Marawi, on the island of Mindanao in the Philippines. Globally, Telegram has played a central role in Islamic State's communication strategy, in part because of a channel feature that lets users broadcast to an unlimited number of other users. Although channels are routinely shut down, IS operatives set up lots of replica channels, which repeat or mirror the same content.